This is a system of laying a hard wearing course of mixed resin and dried aggregates onto either a new or existing tarmac or concrete base. No other surfacing system can deliver ALL of the benefits of Resin Bound. Resin bound permeable paving solution is hard-wearing, attractive and environmentally friendly. 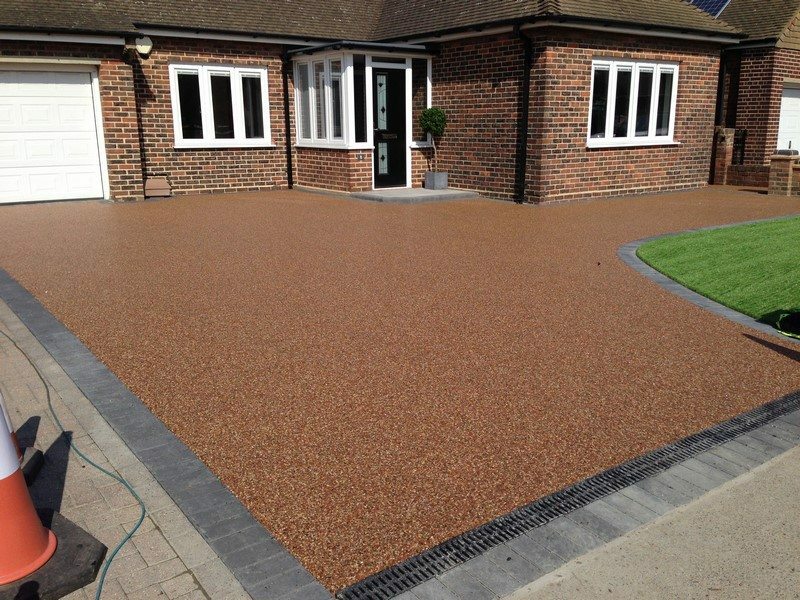 Suitable for a wide range of circumstances, resin bound permeable surfacing is proving a very popular choice for driveways and other outdoor areas. Our unique 5 year guarantee on workmanship & materials gives you ultimate peace of mind that the work we do will be carried out professionally and to the highest standards. Permeable paving solutions are environmentally friendly as they allow rain to permeate the surface rather than, as with more traditional paving solutions such as block paving, concrete, cobbles or tarmac, run off and collect in puddles and streams adding to the flood risk. Our resin bound surfacing is SuDS (Sustainable Drainage Systems) compliant and does not require planning permission. We offer a full service, from surveying the area to be surfaced, offering advice to help you choose the right material and colour to best enhance your property, carrying out any groundwork required and installing your new driveway, patio and paths, so you can relax in the knowledge that the project will be carried professionally and to the highest standards.